LIGHTHOUSE POINT, Fla., Nov. 15, 2016 /PRNewswire/ — What’s more important than Living Well? We only get one life to live. How can we make it our best? That’s the big question addressed in the new book: Living Well Six Pillars for Living Your Best Life http://living-well.com. 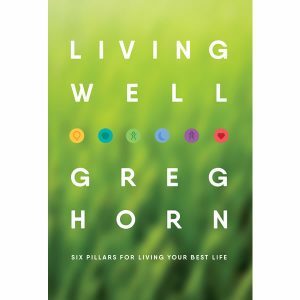 Best-selling author Greg Horn, a pioneer in health and wellness and the former CEO of both GNC and Garden of Life, has consolidated countless research studies on health and nutrition to explain the science behind the art of Living Well. Greg’s access to the world’s leading health experts and experience in the nutrition business let him synthesize and simplify a vast amount of information across a variety of fields—distilling the findings of numerous studies into simple, memorable, and sometimes surprising principles about what really works to improve your health and the quality of your everyday life. Informative and accessible, Living Well proves that a health book can be exciting and even intriguing as it incorporates the Six Pillars of Living Well: Thinking Well, Eating Well, Moving Well, Sleeping Well, Hosting Well and Staying Well – into one whole life plan. What “obesogens” are, and how to avoid them. Why walking can be twice as beneficial to your longevity as running. Why gut bacteria can have more impact on your weight than exercise. New insight on why we need sleep and how it detoxifies your brain. How just one hour of extra sleep per day can make your healthier, smarter, sexier and more productive. How sitting for long periods doubles your health risks, even if you exercise every day. Why you have no “free time” and the one thing you can do to get it back. Why regular swimmers have the health of people 20 years younger. Living Well not only informs you about these surprising health discoveries, it also breaks down what the latest scientific research has to say about living a healthy lifestyle into an action plan that anyone can follow, offering simple and effective ways to turn these insights into actions that can change your health and improve the quality of your life. Living Well is available at Living-Well.com, Amazon.com, BarnesandNoble.com and in bookstores everywhere. LIGHTHOUSE POINT, Fla., May 5, 2016 /PRNewswire/ — A controlled human trial comparing a placebo to a patented form of lycopene and trans-resveratrol (t-RSV) formulation, found in MedVitál® Bio-Resveratrol®, showed significant reduction in foot ulcers in diabetic patients. Orebro University Hospital and School of Health and Medical Sciences, Orebro Sweden, conducted the study entitled “Resveratrol Promotes Foot Ulcer Size Reduction in Type 2 Diabetes Patients.” The study showed a significant reduction in the size of ulcers in the t-RSV group compared to the placebo. The International Scholarly Research Notes Endocrinology published the results. Click here to view the full study with photos. Twenty-four participants with newly diagnosed diabetic foot ulcers (15 males, 9 females) were divided into placebo and t-RSV-treatment groups. Each group was given a either a placebo or the lycopene-trans-RSV combination twice a day for 60 days (in the same daily dosage sold in over the counter in one MedVital® Bio-Resveratrol™ capsule) on top of regular care and general diabetes treatment. At the end of the treatment period, the reduction of diabetic ulcer size was almost complete (95%) closure in the t-RSV group, significantly better as compared to the placebo (50%). T-RSV patients also demonstrated improved performance in the foot pressure test. The researchers note that these results need to be confirmed and further evaluated in larger clinical trials. “This first trial offers new hope that that diabetic patients suffering from chronic ulceration now have a simple, effective over-the-counter option… as simple as taking a daily nutritional supplement. This alone makes this study truly groundbreaking,” added Greg Horn, CEO of Specialty Nutrition Group, Inc., owner of the MedVitál® brand and commercial partner for the technology. MedVitál® Bio-Resveratrol®, sold at GNC stores across the United States, is the first commercial product to feature this patented and clinically studied form of lycopene and trans-resveratrol. About Specialty Nutrition Group, Inc. Specialty Nutriion Consulting is a nutrition brand-building firm focused on commercializing innovative, IP-protected nutritional and health-promoting technologies. © 2019 SPECIALTY NUTRITION CONSULTING, INC.